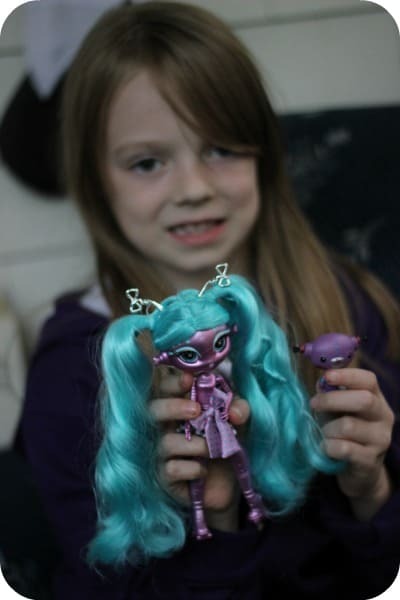 Bridget squealed with delight when she received her very first Novi Stars doll from MGA Entertainment Canada. Novi Stars are not your typical dolls. In fact, they are alien girls on a mission to Earth with the goal of meeting new friends and seeing what our world is like here. There’s four Novi Stars: Alie Lectric™, Una Verse™, Mae Tallick™ and Ari Roma™ (aren’t their names creative?). Bridget received Mae Tallick who is the superstar of the group with her long blue hair and purple skin. She even has real eyelashes and sports a pair of rollerskates. Shes comes with a glow in the dark doll stand and even the package handle turns into an antennae! I didn’t realize this until Bridget showed me by putting it on her head. It has little combs so it will stay put in your child’s hair. She also comes with an alien pet! Mae Tallick is a young 13.7 billion years old with a love for metallic and shiny fashion. She also talks in her robotic voice. Here’s a video of Bridget showing off her new toy. The Novi Stars dolls are available at all major retailers across Canada with a SRP of $24.99. They are geared for kids age 6 and up. Bridget has asked me for the other three dolls to complete the collection. Not only are the Novi Stars unique, but they are also fun! Bridget has been really enjoying her doll. My little girl wants the one with red short red hair one, she has the white one she would like the red one….. So cute! My daughter wants one so bad! How fun! Your daughter looks like she loves it! What a cute little back story on the doll, too. Love the metallic outfit. 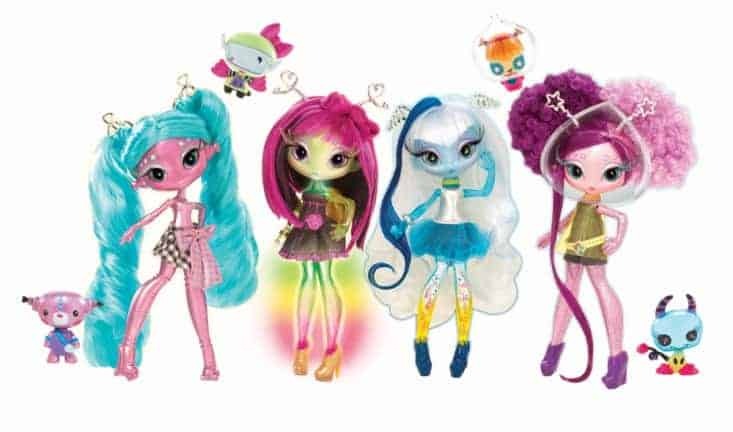 These Novi Stars dolls look great for Holidays gifts for sure! Love the colors! Finally…Aliens for girls! Love it! They are very cute , are they available in the US? Oh cute, I love the alien pet! I’ve never seen these before. Would make a great Xmas gift for my daughter! Oh my! Those are pretty COOL! 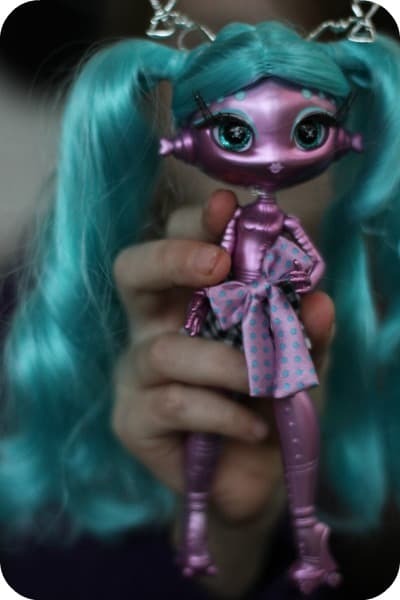 I really like the *idea* of alien dolls for girls. I wish they had gone a bit further, though, and not made the body look like the typical emaciated anorexic, like all the other dolls already available. I also wish that friends, fashion, and their different “personalities” weren’t their main selling points. Why not have an alien character who’s amazing at science or math? Why a pop star? I feel like they missed a big opportunity here to do something DIFFERENT. These are cute little dolls. I wish my nieces were still young enough for them. I don’t think my nephews would like them very well, they tend to be into the super heroes. I’d never heard of these before…I like them! They’re unique, cute, and still appropriate for little girls (rather than trying to encourage them to be teenagers). I have a son so I’m not sure these would be for him, but my little nieces would love these! I’ll have to look into these as a potential future Christmas/birthday present. HELP Moms/Mums…..I have a 3 year old boy….& have to buy for an 8 year old niece. Am I doing the right thing getting these dolls for her??? My daughter is 8 and loves her doll! These are so cute! We’re not in Canada, but now I’m wondering if these are available elsewhere.